A dot-matrix display is a display device used to display information on machines, clocks, railway departure indicators and many other devices requiring a simple display device of limited resolution. The display consists of a dot matrix of lights or mechanical indicators arranged in a rectangular configuration (other shapes are also possible, although not common) such that by switching on or off selected lights, text or graphics can be displayed. A dot matrix controller converts instructions from a processor into signals which turns on or off lights in the matrix so that the required display is produced. 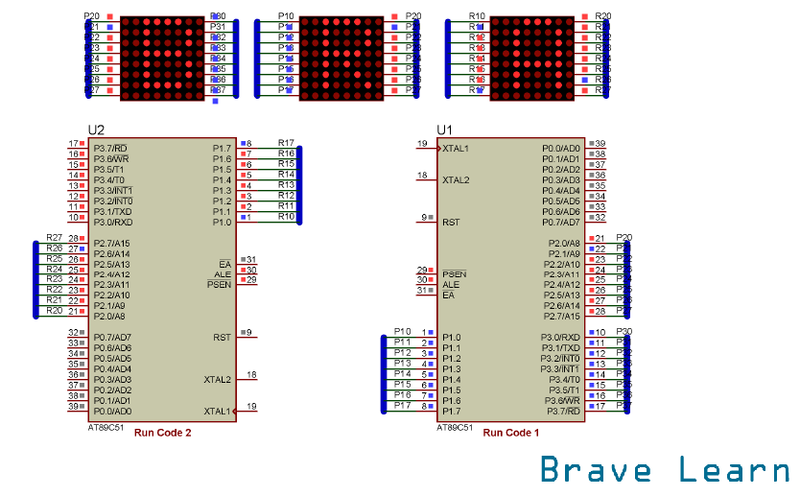 This simple Project interfaces dot matrix 16×8 with famous 8051 Microcontroller AT89C51 and shows scrolling Text “BRAVELEARN” on 3 16×8 dot matrix display’s with no extra IC’s, shift registers required. Please see here how to interface LED with AT89C51 if you are new to 8051 Microcontroller. The above simulation now shows 2 AT89C51, the reason behind is because each microcontroller can’t handle no more than 2 Dot Matrix 16×8 due to port limitation that is why we have used two microcontrollers. Create HEX file using both of these codes for each Microcontroller. As we said earlier each Microcontroller have a capacity of running at least 2 Dot Matrix 16×8. But in the above simulation we have used 2 Microcontroller and 3 Dot Matrix. So, its up to you try attaching 4th Matrix and configure it in the code.